I can't seem to locate the fuel filter on my 2001 GMC Sierra v8. Where should I look? Can someone also tell me the easiest what to drain all of the gas from the tank and what tools I will need to do it??? Thank you! The truck has been sitting for well over a year, and I was told it was a good idea to drain the old fuel and refill the tank so as not to foul/damage injectors... Is this a must??? Thank you much. By itself it is stabil but additives go funky and I've seen it and smelt it. Opinion: If you change fuel filter to the best I know of, Wix or same sold as Napa's Gold line it should stop any gum that might be in the fuel. I have troubles with seasonal equipment and fuel far less down time than this so it's your call. 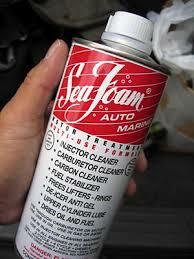 SeaFoam is a powerful solvent that has corrected troubles for me. Was stabilizer used? Indoors or out? Full or part full tank? All should be considered.